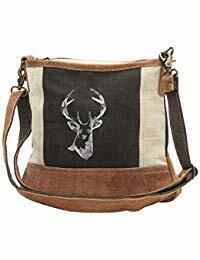 Myra Bags Reindeer Upcycled Canvas Crossbody Bag S-1033 | Accessorising - Brand Name / Designer Handbags For Carry & Wear... Share If You Care! This stylish Myra bag combines functional design with chic high fashion for everyday use. Myra Bags are made from upcycled materials like canvas tarps and tents, using recycled materials to avoid waste. The Myra Bag collection is about creating great fashion that’s earth friendly. We add special detailing like leather handles, trim, and printed graphics to give Myra Bags a one-of-a-kind style. PLEASE NOTE: Each of these bags is truly an original! Much of the materials are recycled from used tarps and tents. These tarps have literally traveled the world and carry the scars and bruises of use. Though we take great care to launder all of our materials and thoroughly clean them, each bag will sport its own unique marks of wear and tear. Slight variations, including stitch marks and minor staining on the canvas, are possible. These are the hallmarks of an up-cycled item. However, please let us know if you receive a bag or tote that seems to exceed these expectations. 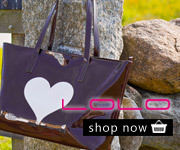 We want you to love your Myra Bag!